Texte en français disponible plus bas. Pic: Paul and Rudolf, Sept.17, 1988- Aaaaarrrrgh!!! Pic: Paul with Rudolf's 1994 Centennial Flying V #1952, August 17, 1996. Pic: Paul with one of Rudolf's '58 Flying V reissue, June 28, 1994. Thanks to everyone who took some time to visit the IN TRANCE Web site. Many of you wonder who has first thought of a project like the one which eventually became IN TRANCE. To answer your question, I'm not a crazy megalomaniac mastermind, but a bit more than the average SCORPIONS fan. For years, it has been generally accepted that some people spent their time, and money, recreating the magic of Elvis, or the Beatles, Pink Floyd, KISS, or Iron Maiden, among others. For me, it's the SCORPIONS, a legendary, misunderstood and underappreciated rock band, hailing from Hannover, Germany. I'm Paul and I'm the rhythm guitarist of IN TRANCE, just like Rudolf Schenker is in the SCORPIONS. Rudolf is also known to be SCORPIONS founder, primary songwriter and guiding light, since 1965. Over the last years, I've mostly heard bad comments about tribute bands. Many tribute bands are created for newcoming bands, ones that only released one album or have almost no history at all, but it's good. IN TRANCE pays tribute to a band that achieved its success over a long period and accomplished very memorable things. Some critics, in "artsy" and intellectual papers and magazines, and on the rock radio (which seems to support only current and alternative rock bands and forget about bands of the past), say that tribute bands members are living in the past and fulfilling some psychological needs. Others say it's the easy way to make money, instead of learning the latest hits and throwing in between their originals, like most "right" bands do, in following the "right" path to a successful career. Let me rectify some facts. There is nothing wrong with nostalgia acts. Nostalgia acts, copy, or tribute bands continue what some artists never finished, or when the artist took another direction and the fans just prefered the former one. As they get older, fans just like to live again some magic moments they had in the past, like some rock shows from the 80's. Also, if the copy or tribute band is quite accurate in its act, younger fans may be able to "get to know" an artist whose performances now belong to the past. 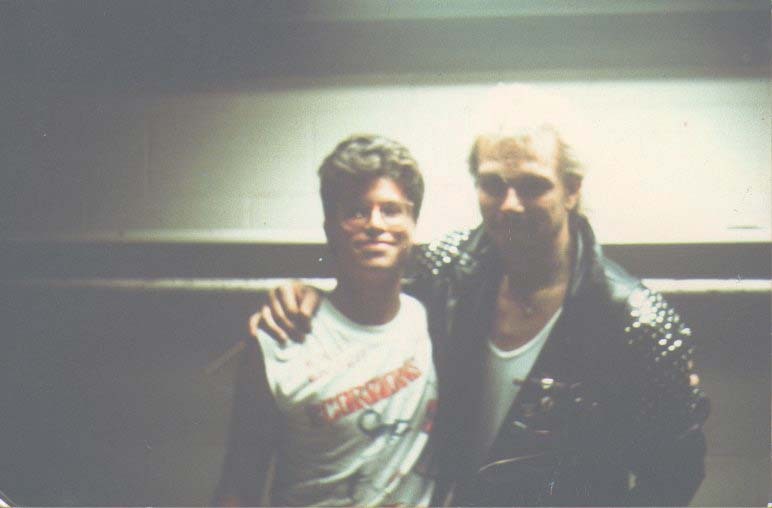 The SCORPIONS have hundreds of new fans, who were still in diapers when they released the mighty Love At First Sting in 1984, just because they heard about IN TRANCE, attended one of our shows, and discovered the music, the magic and the energy of the SCORPIONS. A psychological fullfilement. Maybe, for me. Among the members of IN TRANCE, I'm the only one who's nuts enough to think he's a bandmember of the real SCORPIONS. I think there is at least one crazy fan in every tribute band; someone who has the knowledge about the real thing. I'm very lucky to play with gifted musicians who are willing to play this game. They are also really patient and professional enough to make my dream come true, and I dearly thank them. An easy way to make money? Some tribute bands, just learn the songs like a regular cover band, and do not invest a dime in the sound and apparence of their stage act. But they make money. Dont aspire to join a tribute band if you want to make money. Of course, we dont play for peanuts. We have bills, gasoline, travel expenses and bookers to pay. We also invested significant amounts of money in the stage props and accurate replicas of music instruments and assorted pieces of gear, but it's worth it. Because it looks like the real thing, only smaller. And the fans like it, too. I play someone else songs? Yeah, and I love those songs, like if I had composed them. I play SCORPIONS songs because they need to be played and heard because most of these songs never got the attention and airplay they deserved. What brought me there? My father taught me the guitar with those simple but efficient basic, open chords. As soon as I could pass from a G to a Em under a minute, he said: "You're on your own, son" and I was able then to figure out those Beatles songs I loved. Some months later, I discovered the SCORPIONS when the then just release single No One Like You came out once out of the radio. I was litterally stung by the SCORPIONS. During my teenage years, while most of my friends attended parties during weekends, I spent most of my spare time practicing guitar, most precisely mimicking Rudolf Schenker's moves as Worldwide Live was blasting out of my Sony cassette player (no CD's back then). Since 1985, I still listen to Worldwide Live at least once a week; just ask my wife. Rudolf became a hero for me, not because he plays hundreds of notes per second, but because his rhythm playing really hooked me and is showmanship is really intense and outstanding. He really to live every chord he strums. Also, his personality is really strong, while never becoming outrageous or shocking. Except for a few, humm.., tasty album covers, the SCORPIONS never had to shock or to be scandalous to be popular. That's what really attracted me to them, along with their music. 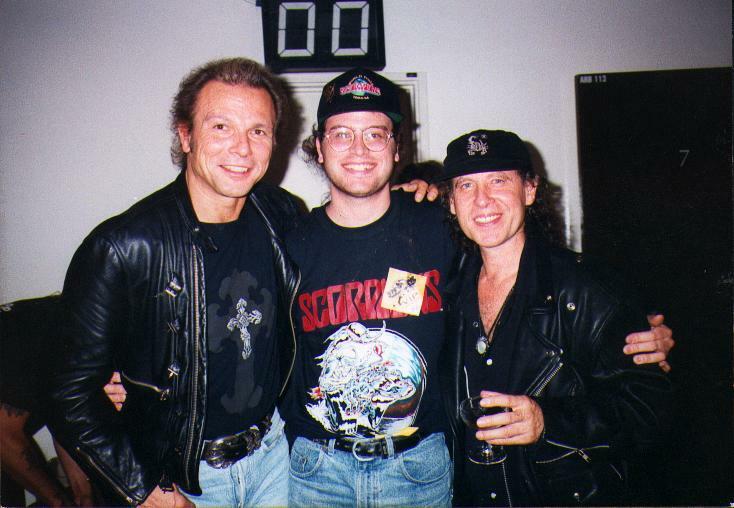 I developped a real passion for the SCORPIONS, who accompanied me everyday of my life since 1982. Music trends came and went, but my faithfulness in SCORPIONS never diminished. 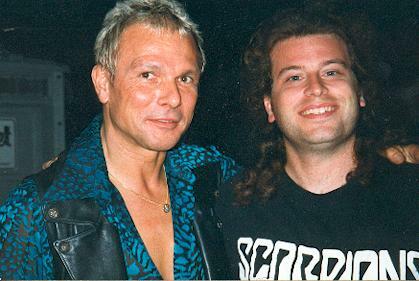 I had in opportunity to meet the SCORPIONS on tour a few times since 1988, and I chatted several times with Rudolf on the phone. So I've been lucky to learn many things about their history, their gear and how they behave together, with the people surrounding them and especially with their fans. I could talk for days about my passion for the SCORPIONS, but what's important for me is that the SCORPIONS brought me many friends, a musical direction, an attitude and developped my taste in guitars and music gear, which led me to my present occupation, guitar repairman/maker. Since my father taught me how to build myself model planes, cars and anything out of wood, I figured I could make the guitars I wanted. I studied electric guitarmaking on my own, through the pages of Guitar Player. Columnists John Carruthers, Dan Erlewine, Craig Anderton and the "factory tours" were indispensable to my guitar making education as well as a book by an English lad named Melvyn Hiscock. I built some guitars for me, and sold a few to friends. Then I gained a lot of experience as a guitar repairman and I came to a point I wanted to make a custom Flying V, also my favorite guitar, for Rudolf. 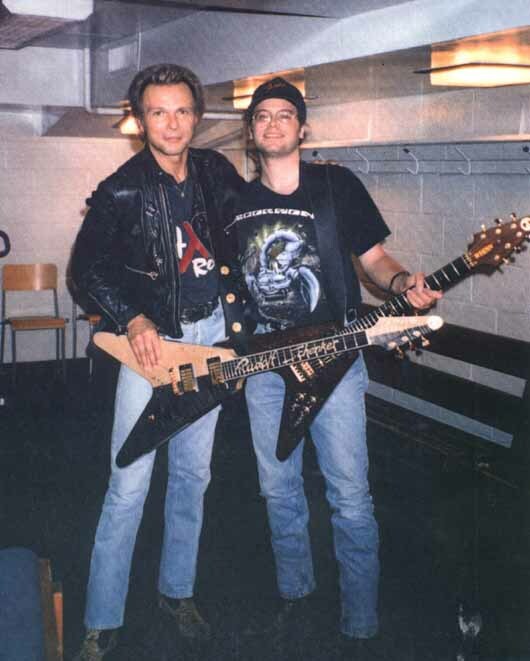 In 1994, I built one and presented him the instrument when the SCORPIONS were on their Face The Heat tour. He loved it and played that guitar onstage that night and this event strenghtened the bond between him and me. Also, I'm very lucky to work with a very gifted electronics technician, André Lavoie, who became my best friend and taught me the best he could in electronics. With him, I demystified electronics and I learned tube and solid-state theory and got handy formulae, schematics and support to make my own preamps, amplifiers and all kind of electronic devices and getting the most of them. Andre always have a clue to a problem. In ten years, I went from installing pickups and repairing crummy guitar circuitry to building poweramplifiers, eqs, crossovers, hi-gain tube preamps and reconing speakers. Thats why you may encounter, while visiting this site or attending an IN TRANCE show, many instruments and pieces of gear bearing the PGG (Paul Gagné Guitars) or ALE/PGG(André Lavoie Electronics/PGG) brands. Visit the link section to check André's website. As most of you know, my dream was to recreate the SCORPIONS, like their buddy Schumacher, at full bore. Also, I wanted to get their gear to match the band look and sound to the most. I made several guitars. Copies of existing SCORPIONS instruments or variations. Some are from raw wood to finished instruments, some are genuine Gibson and Fender instruments, some are concoction of existing parts. I'm quite proud of the results. You think I use to much guitars onstage? They all have a special use, and honestly, I'm very flashy. Wait to see; some other fancy stuff is in the works for both Jeff and Marc-André. Some may find our show not 100% accurate or period-correct? Well, we did not set the IN TRANCE show in a particular time frame of SCORPIONS career, spanning over three decades. We picked the best elements of the different eras, mixed them together and tried to squeeze 30 years of SCORPIONS songs, music instruments, stage moves and attitude in a two hour show. And forget about Marc-André wearing those striped black and yellow spandex pants! Sorry Matthias! So what are the SCORPIONS doing these days? They are quite fine. People think theyre out of the map because there are not as noisy as they were ten, fifteen years ago. They are alive and well, just less present on the North American music scene. In the past few years, the SCORPIONS tried to have their music known and heard by a younger audience. But music styles changed. Kids seem to be attracted by harder, streetwise music as social values changed, especially in North America. The SCORPIONS, I think, found some difficulties to adjust to that. Will the SCORPIONS release a follow-up to Face The Heat(1993)? I hear that question very often. Too often. Since Face The Heat, the SCORPIONS released Live Bites(1995), a live LP, then Pure Instinct(1996) and Eye To Eye(1999). In 1997, Mercury/Polygram released a 2-LP compilation of the best songs of their 1979-1995 association(Deadly Sting:The Mercury Years). In 2000, the SCORPIONS teamed with the Berliner Philharmoniker to record Moment Of Glory, a unique collaboration between Germany's most famous and oldest rock band and oldest and biggest philharmonic orchestra. In February of 2001, they recorded a live, unplugged-style album, recorded in Lisbonne, Portugal, and released in May 2001 under the name Acoustica. They are currently touring, in support of the two last albums. In a few months, they are supposed to go back in studio to record a strong rock album, with the producer who worked with them from 1975 to 1988, Dieter Dierks. This man gave them the "sound" and a musical direction. Also, the SCORPIONS announced the release of a box set that will celebrate the 30th anniversary of their first release, Lonesome Crow. I hope these album releases will be more publicized than the last ones. As Brian Setzer pointed out, in the October 2001 issue of Guitar Player, when you release an album under a label, there is people in the record company that are behind you to push your work and get it played and advertised. In 1995, the SCORPIONS left Mercury/Polygram because all the people who were behind them since 1979 had left and they felt nobody was supporting them anymore. They've been offered a four album contract by East/West, a subsdiary of the WEA group, and there, my feeling is, they had no support at all from the beginning. It's sad, because they had great music recorded on this label, but very little advertisement and somebody did not choose to release the right singles that may have attracted the record buyers. Thats my opinion, though. These albums, Pure Instinct and Eye To Eye, reflect a bit the introspective state of the SCORPIONS of the last years. The band went through some internal crisis since 1992, with the departure of longtime bassist Francis Buchholz, related with litigations with the German fiscal authorities. Record and ticket sales lowered for music acts like the SCORPIONS, although it's not related with the quality of their offerings. As I said before, the record buyers have changed. They're younger and SCORPIONS values are maybe not cool enough for them. It's sad. Singer Klaus Meine and Rudolf lost their fathers to death and also, drummer Herman Rarebell, an important creative force within the band since 1976, left in 1996. The SCORPIONS still carry on with Lübeck-born bass player Ralph Rieckermann. Ralph joined the band in 1992 when Herman Rarebell found him in Los Angeles were he was working on film scoring. Although the SCORPIONS used session drummer Curt Cress for the Pure Instinct album in 1995-96, American drummer James Kottak, previously from Kingdome Come and Ronnie Montrose, was hired in June 1996 and he's now a full-time member of the Scorpions. He also plays in his own band called Krunk(see links page). So if somebody wants to share his, or her, opinions about SCORPIONS past, present and future, e-mail me. I can't conclude without thanking everyone who helped IN TRANCE taking form along the years. Of course, I didn't put my gratitude in a particular order, so dont be frustrated if your name, which may happens to appear here, is not at the top of the list, or not at all. Like the SCORPIONS, IN TRANCE loves everyone. I'm sorry if I omitted someone. Let me know. Scorpions and showed me how great that band was. Jeff, Steeve, Stéphane and their girlfriends. music they both share with me. -My parents, Robert & Margot, to have shared with me their passion for music. -Jeff Bard, everyone's friend, musical and spiritual guide. sound good in bad sounding clubs. -Denis Fecteau, for friendship and software support. -Frank Schenker, my friend the super Scorpions analyst. and Bach. You've been a goal to reach for many guitarists and you are simply the best. for the influence on my playing. -André Dorval, for you support and good audio counselling. -Tommy Papathanasiou, our official ``air guitarist``. challenge to play in a tribute band. and for the genuine and unforgettable Italian food. and plays much better when everyone smiles. Image: Paul et Rudolf, septembre 1988-Aaaaarrrrgh! Image: Paul avec la Flying V Centennial #1952 (1994) de Rudolf, 1996. Image: Paul avec une reedition de Flying V '58 de Rudolf, juin 1994. Merci à tous ceux qui ont pris le temps de visiter le site web d'IN TRANCE. Vous vous demandez peut-être qui a bien pu mettre sur pied un projet tel IN TRANCE. Pour repondre à votre question, je ne suis pas un mégalomane fou, mais bien plus que l'amateur moyen des SCORPIONS. Depuis plusieurs années, il est devenu monnaie courante de voir des groupes qui recrent la magie musicale et scénique d'artistes tels que les Beatles, Elvis, Pink Floyd, Kiss et Iron Maiden, entre autres. Moi j'ai choisi de recréer et de rendre hommage aux SCORPIONS, un groupe rock incompris qui n'a jamais été apprecié a sa juste valeur, issu d'Hannover (Hanovre) en Allemagne. Mon nom est Paul et je suis le guitariste rhytmique d'IN TRANCE, tout comme Rudolf Schenker l'est dans les SCORPIONS. 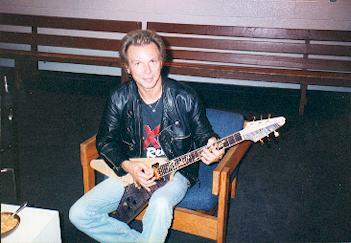 Rudolf Schenker est aussi reconnu comme fondateur, auteur principal et visionnaire des SCORPIONS, et ça, depuis 1965. Ces dernires années, je n'ai entendu que du négatif sur les groupes hommages. On critique certains groupes hommages au fait qu'ils recréent un groupe récent qui n'a qu'un ou quelques albums à son actif, ou qui n'a pas encore assez de notoriété historique. Certaines critiques viennent de journaux, intellectuels et artistiques, et de la radio rock, qui ne semble qu'accorder de l'importance aux groupes actuels et oublie ce qui s'est fait dans le passé. Ils critiquent le fait que les membres des groupes hommages ont sûrement des problèmes psychologiques, et qu'ils font de l'argent avec les succes et l'image d'artistes déjà établis, au lieu de jouer quelques interprétations en y insérant quelques compositions. Bien sûr, c'est le cheminement normal de ceux qui aspirent au succès. Il n'y a rien de mal à utiliser la nostagie pour y présenter un spectacle. Les groupes et spectacles hommages continuent ce que plusieurs groupes ou artistes n'ont jamais terminé. Souvent, l'hommage présente un artiste à la periode que les amateurs (j'utiliserai "fans" pour alléger le texte.) les préfèrent, avant que l'artiste ne prenne une direction artistique qui fut boudée par ses fans. En vieillissant, le fans veulent revivre des moments magiques qu'ils ont vécus dans le passé, tels que des spectacles rock dans les annees '80. Aussi, si le groupe hommage est fidèle à l'artiste original, des fans plus jeunes pourront revivre les performances d'artistes dont les prouesses scéniques appartiennent au passé. Les SCORPIONS ont acquis de nombreux fans, qui étaient probablement encore qu'en couches lorsque le majestueux Love At First Sting fut lancé en 1984, seulement parce qu'ils ont eu la curiosité d'assister à un spectacle d'IN TRANCE et ils ont découvert la musique et l'énergie des SCORPIONS. Une thérapie psychologique les groupes hommages? Peut-être, pour moi. Parmi les membres d'IN TRANCE, c'est moi qui est probablement le plus débile, assez pour penser que parfois, je fais parti des vrais SCORPIONS. Mais farce à part, je crois que dans tous les groupes hommages, il doit y avoir au moins un membre qui connait le vrai groupe à fond pour garder une ligne de conduite et une certaine authenticité. Folie, ou excès de perfectionnisme, je suis très chanceux de pouvoir jouer avec des musiciens qui jouent le jeu, et qui ont fait de mon rêve une realité, et je les remercie du fond de mon coeur. Une facon facile de faire de sous? Il y a des groupes hommages qui font de l'argent car il n'investissement pas dans l'apparence et le son de leur spectacle, comme un simple groupe d'interprétations(covers). Je n'ai pas de préjudices envers les groupes qui ne font que des interprétations diverses, mais tu mets un hommage sur pied, alors tu lui donnes le bon look. N'aspirez pas à faire de l'argent si vous vous joignez à un groupe hommage. Bien sûr, on ne joue pas gratuitement. Nous avons des factures, des dépenses diverses pour le transport, le carburant, l'entretien du matériel, et des agents à payer. Nous avons aussi investi des sommes considérables sur l'apparence de la scène, sur des répliques d'instruments et pièces d'équipement diverses. Mais ça vaut la peine, car ça ressemble à la vraie affaire, et les fans en redemandent. Je joue la musique d'un autre? Oui, et après? les orchestres symphoniques du mondes entier jouent bien Mozart et Beethoven depuis 200 ans. J'aime les chansons des SCORPIONS, comme si je les avais composées moi-même. Je m'entête à rejouer ces chansons des SCORPIONS, car elles n'ont selon moi jamais reçu une diffusion équitable à leur qualité et elle on besoin d'être entendues et appreciées encore. Ce qui m'a mené là? Mon père m'a montré jouer de la guitare en m'enseignant ces accords de base, simples mais efficaces. Des que j'ai pu passer d'un sol majeur à un mi mineur en moins d'une minute, il m'a dit: "Voila fiston, apprend le reste par toi-même". Et comme ¸ça, j'ai pu apprendre à jouer ces chansons des Beatles que j'aimais tant. Quelques mois plus tard, j'ai entendu cet extrait, No One Like You, à la radio. J'ai été piqué par le scorpion. C'était en 1982. Pendant mon adolescence, alors que mes amis allaient fêter, je passais mon temps libre à pratiquer la guitare, plus précisément à imiter Rudolf Schenker alors que mon radio-cassette Sony (pas de CD à cette époque!) crachait l'energie brute de Worldwide Live dans le sous-sol. Cet album "live", paru en 1985, est mon préféré et je l'écoute encore au moins une fois par semaine depuis ce temps. Rudolf est devenu un héros pour moi, pas parce qu'il est un guitariste extraordinaire, mais parce que son jeu de guitare rythmique est accrocheur et que sa presence sur scène est très intense et remarquable. Il semble vivre chaque note et accord qu'il gratte sur sa guitare. Aussi, il a une tres forte personnalité et n'a jamais cherché a être outrageux pour reussir et se faire remarquer, contrairement d'autre vedettes rock. À l'exception de quelques pochettes d'albums disons, hummm, délicieuses, les SCORPIONS n'ont jamais eu besoin de faire scandale ou de choquer pour s'attirer de la popularité. C'est ce qui m'a attiré vers eux, avec leur musique, bien-sûr. J'ai developpé une véritable passion pour les SCORPIONS qui m'ont accompagné dans chaque journée de ma vie depuis 1982. Les modes musicales ont souvent changé depuis, mais ma fidelité enverr les SCORPIONS n'a jamais diminué. 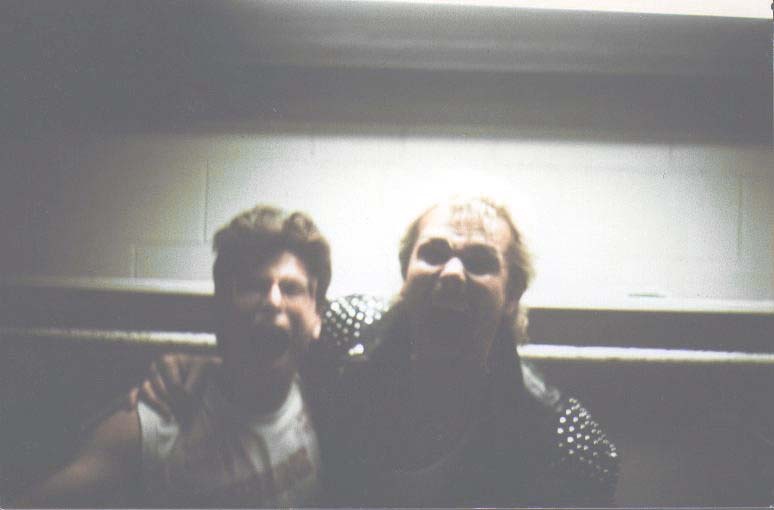 J'ai eu l'opportunité de rencontrer et d'accompagner les SCORPIONS quelques fois lors de leurs tournées depuis 1988, et aussi de causer avec Rudolf au téléphone de façon plus ou moins régulière. Donc j'ai eu la chance d'explorer à fond leur histoire, leur équipement et de voir comment ils agissent entre-eux, avec les gens qui les entourent et surtout avec leurs fans. Je pourrais parler longtemps de ma passion pour les SCORPIONS, mais ce que je retiens, c'est que cet engouement m'a amené beaucoup d'amis, du respect, des contacts, une direction musicale, une attitude positive et surtout que cela a developpé mon attirance pour les guitares et les instruments de musique. Cela m'a mené vers mon occupation actuelle, réparateur et constructeur de guitares. Depuis que mon père m'a montré comment il est simple de fabriquer des modèles reduits d'avions, d'autos et n'importe quoi d'autre avec du bois, j'ai découvert que je pouvais fabriquer mes propres guitares. J'ai etudié la lutherie de guitare de façon autodidacte, à travers les pages de Guitar Player. Les auteurs d'articles John Carruthers, Dan Erlewine, Craig Anderton et les tours guidés en photos de manufacturiers de guitares, ont étés instrumentaux dans ma formation, de même qu'un livre d'un gentleman anglais nommé Melvyn Hiscock. J'ai fait quelques guitares pour moi, d'autres pour des connaissances. Ensuite j'ai acquis beaucoup d'expérience comme réparateur et luthier, et j'en suis venu au point que j'etais prêt à fabriquer une guitare Flying V , en l'occurrence ma guitare preferée aussi, pour Rudolf. En 1994, j'ai finalement offert un instrument de mon crû à Rudolf alors que les SCORPIONS visitaient Québec durant leur tournée Face The Heat. Il a adoré la guitare et la utilisée sur scène ce soir-là pour plusieurs pièces. Cet évènement a bien-sûr solidifié ce lien qu'on entretenait depuis quelques années et j'ai aussi obtenu beaucoup de reconnaissance de mes pairs en retour. Aussi, j'ai la chance de travailler à tous les jours avec un talentueux technicien électronique, André Lavoie, qui est devenu mon meilleur ami et qui m'a appris plus que mon cerveau peut comprendre de l'électronique. Avec lui, plusieurs mythes concernant l'électronique sont disparus de mon esprit, et j'ai appris beaucoup de théorie sur les lampes, les transistors, et l'amplification. Il m'a transmis des formules pratiques, de plans et de l'aide pour fabriquer mes propres préamplificateurs, amplis et trucs électroniques de toutes sortes. André a toujours une solution pour un problème, peut importe sa nature. En dix ans, je suis passé à ne savoir que réparer les circuits de guitares crasseuses à fabriquer des amplis de puissance, des égalisateurs, des filtres(crossovers), des préamplis à lampes et à recôner et restaurer des haut-parleurs. C'est pourquoi qu'en visitant ce site ou en assistant à un spectacle d'IN TRANCE, vous rencontrerez des instruments et des pièces d'équipement portant les marques PGG(Paul Gagné Guitars) ou ALE/PGG(André Lavoie Electronique/PGG). En visitant notre page de liens, vous y trouverez le lien pour le site d'André. Comme la plupart de vous le savez, mon rêve a toujours été de recréer les SCORPIONS, tels leur compatriote Schumacher, la pédale au fond. Donc il est logique pour moi et mes comparses de jouer avec des instruments similaires à ceux des SCORPIONS pour obtenir leur son et l'image qu'ils projettent sur scène depuis si longtemps. J'ai fabriqué et obtenu plusieurs instruments au fil des ans. Des copies d'instruments que les SCORPIONS utilisent ou des variations sur le thème. Certains ont été fabriqués à la main de A à Z. D'autres sont de véritables instruments Fender, Gibson et autres. D'autres sont un mélange de composantes déjà existantes. Je suis assez fier du résultat. Vous trouvez que j'utilise trop de guitares sur scène? Elles ont toutes une utilité et, honnêtement, je suis tres "flashy" et poseur. Attendez de voir, il y a encore d'autres instruments en construction pour Jeff et Marc-André. Quelques-uns trouvent notre spectacle plus ou moins precis ou pas historiquement correct? Bien, nous n'avons pas situé le spectacle d'IN TRANCE dans un cadre précis de la chronologie des SCORPIONS, qui s'étend sur au moins trois décennies. On a retenu les meilleurs éléments des époques différentes, on les a mélanges et tenté de faire entrer 30 ans de musique, d'instruments, de mouvements scéniques et d'attitude des SCORPIONS dans un spectacle de deux heures. Pardon à Matthias mais oubliez cette idée de voir Marc-André avec ces culottes en spandex rayé noir et jaune! Qu'est-ce que les SCORPIONS font ces jours-ci? Ils vont bien. Les gens les croient hors du circuit car ils ne sont pas aussi bruillants qu'il y a dix, quinze ans. Ils sont juste moins présents sur la scène musicale nord-americaine. Ces dernieres années, les SCORPIONS ont essayé de faire connaitre leur musique à un public plus jeune. Mais le public a changé. La musique actuelle est plus urbaine, plus dure, plus près des problèmes des jeunes, et leur montre un avenir sans issue. Les SCORPIONS ont toujours essayé de montrer le contraire et ils semblent avoir de la difficulté à s'ajuster aux valeurs actuelles. Est-ce que les SCORPIONS vont faire suite à Face The Heat(1993)? J'entend cette question très souvent. Trop souvent. Il semble y avoir un manque de diffusion d'information pour les SCORPIONS depuis le milieu des années 90. Depuis ce temps, les SCORPIONS ont lancé Live Bites(1995), un album "live" qui fait suite aux majestueux Tokyo Tapes(1978) et Worldwide Live(1985). À la suite de la fin de leur contrat chez Mercury/Polygram, les SCORPIONS ont demenagé leurs pénates chez WEA et ont lancé Pure Instinct(1996) et Eye To Eye(1999), une expérience avec la musique pop que la plupart des gens ont jugée désastreuse. En 1997, Mercury/Polygram a aussi lancé une compilation double, Deadly Sting:The Mercury Years, qui retrace les meilleurs moment de leur association avec les SCORPIONS, soit de 1979 à 1995. À la suite de l'échec de Eye To Eye, les SCORPIONS ont finalisé un projet lancé en 1995, soit de faire equipe avec un orchestre symphonique. Après d'infructueuses négociations avec Michael Kamen, ils ont decouvert en Christian Kolonovits un collaborateur unique, et ont étés joints par le Berliner Philharmoniker. Ce projet mis au monde Moment Of Glory(2000), qui présente ensemble les deux plus grandes et anciennes formations musicales allemandes. À la suite de cet élan, les SCORPIONS ont presenté à Lisbonne au Portugal, en février 2001, un spectacle de style "unplugged" qui fut enregistré et endisqué sous le nom d'Acoustica et lancé en mai de cette année. Ils sont présentement en tournée pour promouvoir ces deux derniers albums. Au moment ou j'écris ces mots, j'ai appris qu'ils retourneront en studio, avec Dieter Dierks, celui qui leur a donné de 1975 à 1988 leur "son" et une direction musicale, pour enregister un album rock plus fort que les derniers. Aussi, il est fort possible qu'un coffret soit lancé pour célébrer les 30 ans du lancement de leur premier album, Lonesome Crow(1972). Espérons que ces albums recevront la publicité et le support qu'ils méritent. Et oui le support, parlons-en. Tel que l'ex-Stray Cat Brian Setzer l'a specifié dans le Guitar Player d'octobre 2001, quand vous lancez un album sous une étiquette, un "label", il y a des gens chez cette compagnie qui doivent être derrière vous et qui doivent pousser votre travail à travers cet océan qui est le marché du disque, afin que votre album soit publicisé et qu'il soit mis suffisamment en rotation dans les stations de radio. Ensuite le public jugera. En 1995, le SCORPIONS ont quitte Mercury/Polygram, non seulement car leur contrat était venu à terme, mais aussi parce que tous ceux qui étaient derrière eux dans cette compagnie depuis 1979 avaient quitté et les SCORPIONS ne se sentaient plus supportés du tout par les nouveaux venus. À la suite de cette fin de contrat, les SCORPIONS se sont vu offert un contrat de quatre albums par East/West, une filiale du groupe WEA, et mon "feeling" est qu'ils n'ont pas eu de support de ce label dès le tout debut. C'est triste, car ils ont quand même enregistré du bon materiel pour ce label, mais pas de publicité du tout et quelqu'un n'a pas choisi de lancer les bons "singles" pour attirer des acheteurs potentiels pour Pure Instinct et Eye To Eye. C'est mon opinion toutefois. Ces deux albums, Pure Instinct et Eye To Eye, reflètent l'état introspectif dans lequel les SCORPIONS ont été plongés ces dernières années. Le groupe est passé à travers quelques situations qui ont provoqué des bouleversements, depuis 1992, avec le départ de Francis Buchholz, bassiste des SCORPIONS depuis 1973, qui a eu des demelés avec le fisc et la justice allemands. Ensuite, les ventes d'albums et l'affluence aux spectacles a significativement diminué pour les artistes de la génération des SCORPIONS, malgré la bonne qualité de leurs albums et spectacles. Comme je l'ai écris plus tôt, les acheteurs d'albums ont changé. Ils sont plus jeunes, et les valeurs des SCORPIONS ne sont probablement pas assez "cool" pour eux. C'est triste. À la suite de ces evenements, Rudolf et le chanteur Klaus Meine ont été affectés par les décès de leurs pères. Aussi, il y a eu le départ du batteur Herman Rarebell qui était une force créative assez importante parmi les SCORPIONS de 1976 a 1996. Il a co-écrit plusieurs "hits" donc le classique Rock You Like A Hurricane. Donc si il y en a parmi vous qui veulent discuter de IN TRANCE, des groupes hommages et du passé, présent et futur des SCORPIONS, envoyez-moi vos courriels. Je ne peux conclure ce bref exposé sans remercier ceux qui m'ont assisté à mettre IN TRANCE sur pied au fil des ans. Bien-sûr, je n'ai pas mis ma gratitude dans un ordre particulier, donc ne vous battez pas entre vous et ne soyez pas frustrés si votre nom n'est pas au début de la liste, ou pas là du tout. Comme les SCORPIONS, IN TRANCE vous aime tous. Je suis desolé si quelqu'un a été oublée. Laissez-moi le savoir. Schenker et les autres, pour ne nommer qu'eux. l'évolution de cet hommage aux SCORPIONS depuis 1986. -Nadhya, l'amour de ma vie, et mes amours Olivier et Ophelie. Steeve, Stéphane et leurs compagnes de vie. cet amour pour la musique. -Jeff Bard, l'ami de tous, guide musical et spirituel. de Moonlyght, pour ce mega support envers IN TRANCE. -Denis Fecteau, pour amitié et support informatique. -Mon ami, ``Mr.Dentist`` , Artyom Belogubov a Moscou. vital pour le hard-rock et le metal a Quebec. -Ben Lortie, Pat Paquet et Francois Tanguay au Dagobert. pour cette influence sur ma perception de la guitare. guitaristes, mais c'est toi le meilleur. -André Dorval, pour son support et les bons conseils en audio. -Tommy Papathanasiou, notre ``air guitarist`` officiel. de maintenir en vie un groupe hommage. -Karl Adomeit et Patrick Aubé, peut importe où vous ètes. projets musicaux, dont IN TRANCE. et pour cette authentique et inoubliable cuisine italienne. Je suis désolé les gars, mais on devait aller de l'avant. et hors de la scène.